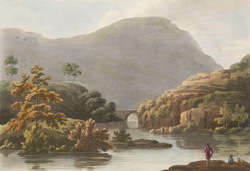 View of Pont Aberglaslyn in Caernarvonshire, Wales. Before the estuary of the River Glaslyn, or ‘Blue Lake’, was reclaimed by the construction of an embankment at Porthmadog boats came as far in land as this stone bridge. The surrounding landscape is rugged and beautiful being as it is, located in the Snowdonia mountain range.